Merang mushroom and tiram mushrooms are perisable agricultural products. Processing mushrooms into flour is one of the intermediate products that have a wider use value, such as for meatballs, nuggets, and flavorings natural. The purpose of these research was to evaluate the physicochemycal characteristics of paddy straw mushroom (Volvariella volvacea) and oyster mushroom (Pleurotus ostreatus) flour with variation of blanching treatment. Physical characteristics included rendemen, color and degree of white, and bulk density. Chemical characteristics included water content, ash, protein, fat, carbohydrates, and dissolved proteins content. The results showed that physical characters for rendement, color, and white degree were the highest value on tiram mushroom flour without blansing. The bulk density of mushroom flour was no significant of difference. Tiram mushroom flour without blansing contained the highest content of water (9.09%), ash (2.79% db), protein (43.69% db) and fat (2.33% db). Blanced merang mushroom flour contained the highest content of carbohydrate (67.74% db) and protein (19.34% db). YULIANI, Y.; MARYANTO, M.; NURHAYATI, N.. KARAKTERISTIK FISIK DAN KIMIA TEPUNG JAMUR MERANG (Volvariella volvacea) DAN TEPUNG JAMUR TIRAM (Pleurotus ostreatus) TERVARIASI PERLAKUAN BLANSING. JURNAL AGROTEKNOLOGI, [S.l. ], v. 12, n. 02, p. 176-183, dec. 2018. ISSN 2502-4906. 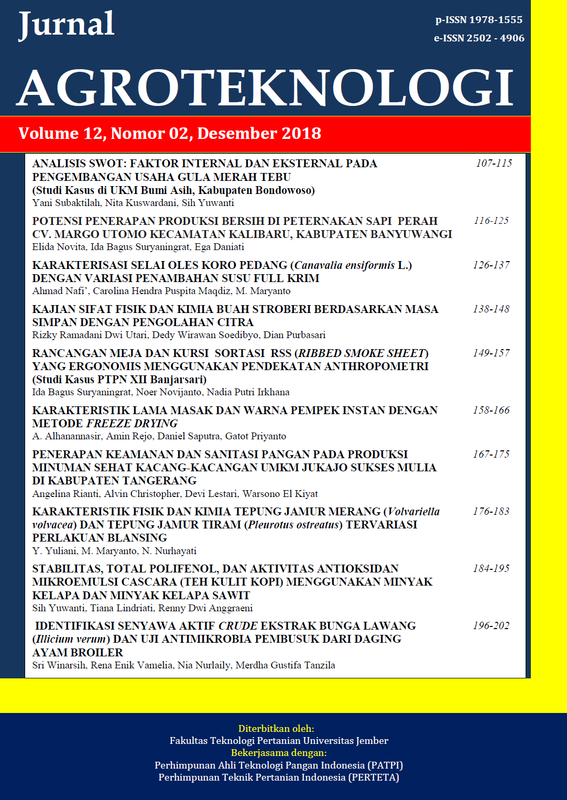 Available at: <https://jurnal.unej.ac.id/index.php/JAGT/article/view/9296>. Date accessed: 23 apr. 2019. doi: https://doi.org/10.19184/j-agt.v12i02.9296.